Madurai Chettinad mess was not on our list initially, but out of a friend’s recommendation, we decided to try it out. The journey to satisfy our hunger had quite a dramatic start as we skipped breakfast to make more room for the afternoon feast. It was exciting to ask for direction and walk through a small lane in search of the destination. In a while, we reached. It was more like a small den, with a lot of people eating to their heart and many were waiting for their turns. To our fortune, we got seated in the next 15 minutes. 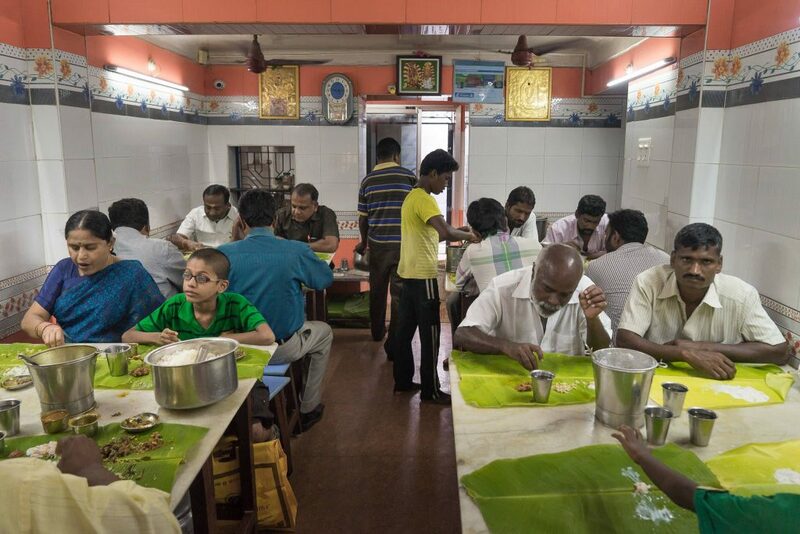 Fresh banana leaves rolled out and water served – that set the mood up! The owner himself was on the move all the time and he was the one who enquired us our order with a smile. In our own style, we asked him to serve everything they had in the kitchen. With a bigger smile, he personally went in and brought out in a while, a tray full of hot delicious looking items. We started with steaming rice and Meen Kulambu, which clearly was the best of all for we had a lot of ‘once more’ with it. Fried chicken chops dipped in spicy gravy was next and before we could get enough out of it, Muyal (rabbit) Kari came in to literally pamper us with its softness and minced spices. From Chicken to Crabs, a range of Omelets was served as regular fillers. 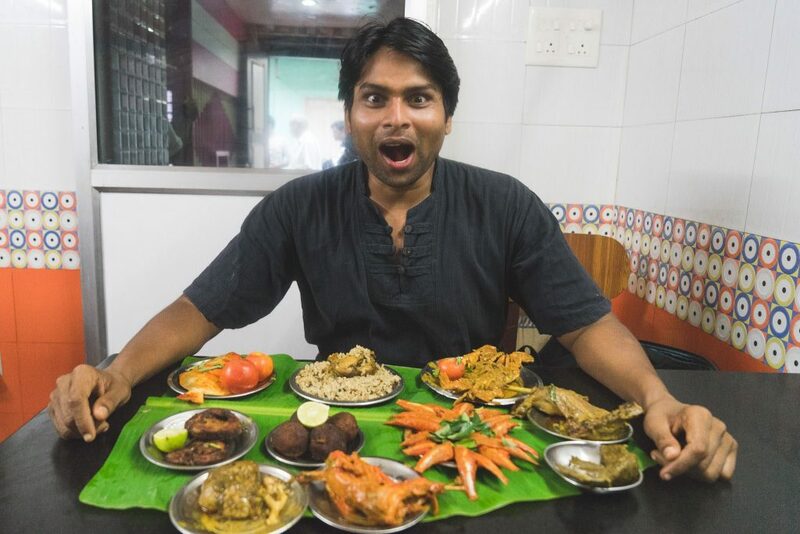 It took us a while to switch over from the mesmerizing Meen kuzhambu to other tempting gravies. All the gravies were oozing with intense ingredients, grinded and mixed the way it has to be, taking our taste buds for a toss. 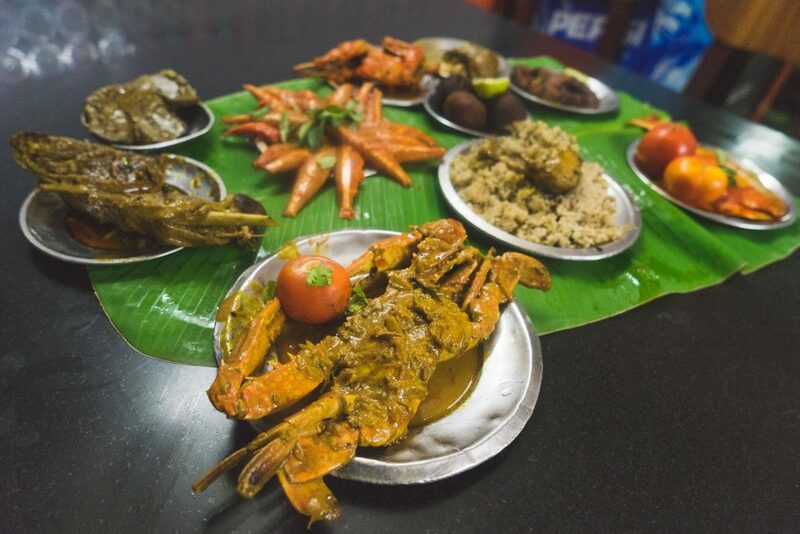 Mutton, Fish, Rabbit, Dove, Kaadai, Kozhi, Vaan Kozhi and Prawns were the prime dish domains and a variety of cooking was done around these. It was more of martial arts that we played over the leaf for an hour or more. And how can we forget the service we were offered. So friendly and so true! It wasn’t the kind of place where serving food with love is taught to the servers, but it naturally comes from their heart. The owner does it from the front and the rest follow him naturally. For any Non-Veg lover who is in Madurai or is planning to visit Madurai anytime sooner, this is THE place to hit and indulge your senses. It is located near the north gate of Madurai Meenakshi Amman temple. For all our adventures on the green leaf, the bill was amazingly cheap at the end, and yes, worth every rupee.